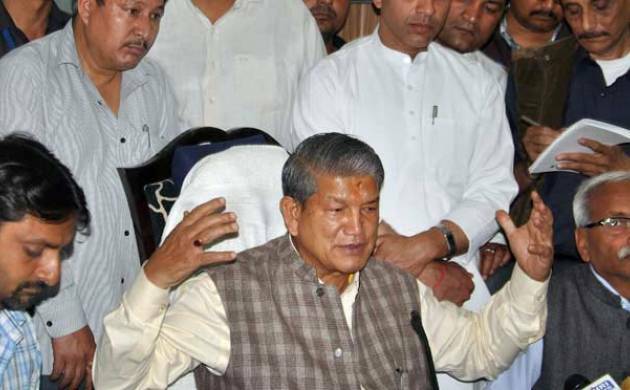 Deposed Chief Minister Harish Rawat today charged BJP leaders with roaming the streets of Uttarakhand with bags of money to buy Congress MLAs, evoking a sharp reaction from the saffron party which said he was making a wild allegation to divert people’s attention from his own “black” deeds. “The BJP’s central as well as state leadership is roaming the streets and villages of Uttarakhand with bags of money in search of Congress MLAs to lure them over. It is a matter of great concern that several BJP national vice presidents and general secretaries are busy doing this in Uttarakhand. “Statements by BJP leaders that they are in touch with 3-4 more MLAs only confirm this,” Rawat told reporters here. He also charged the BJP with making the most corrupt of Congress ministers and MLAs the jewels of its crown. Reacting sharply to Rawat’s allegation, state BJP chief Ajay Bhatt dared him to name the legislator who had been approached and bought by the party. Terming it as Rawat’s ploy to divert people’s attention from the sting CD in which he has allegedly been shown trying to buy the support of rebel MLAs, Bhatt said, “Rawat has been caught openly indulging in horsetrading in the sting CD which brought the disrepute to Uttarakhand. “It is to divert attention from his black deeds that he is making wild allegations against BJP to malign it. Rawat should tell us which MLA we tried to buy, who contacted whom and who is moving around with bags of money to buy Congress MLA. We are a party which idolises Atal Bihari Vajpayee who quit as PM when he was short of just one vote. On the other hand there is Congress whose national leader Rahul Gandhi stands by Harish Rawat in all his black deeds,” the BJP leader said. Bhatt said rebel Congress MLAs had come to BJP of their own accord as they felt suffocated under a “corrupt Rawat government”. Accusing Rawat of not being able to keep his flock together, he said he has kept his MLAs in confinement as he knows once they are unleashed, several of them will jump over to BJP. Taking a jibe at Rawat for going to people and asking them what his guilt was, the BJP leader said it was all meant to evoke the sympathy of people but warned him that they now know his reality and cannot be taken in. “To get people’s sympathy, Rawat is asking them what is his guilt. He does not seem to realise that not only Uttarakhand but the whole country knows that all the guilt is his,” Bhatt said. Rawat had also accused the BJP of having his padyatras in Dehradun pelted with stones saying this was an attempt by the party to not let him reach out to people and expose the “undemocratic” manner in which a popular government had been dislodged in Uttarakhand.